Founded on February 9th, 1983. 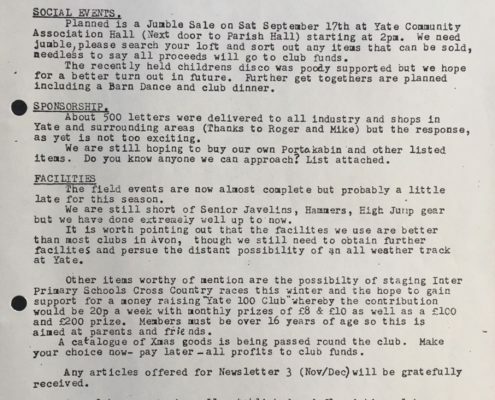 The first AGM was held on 17th March, 1983. 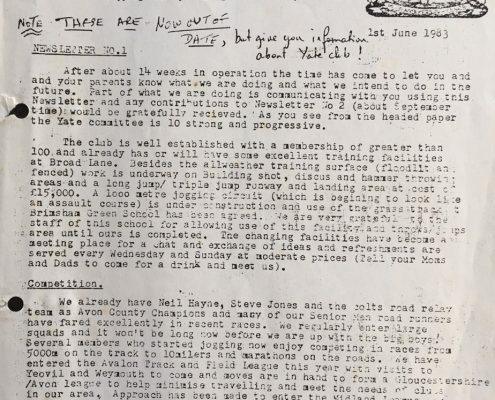 Mike Smith, the catalyst that brought together a few interested people to form a new club in the ever expanding Yate was also the driving force in the clubs initial successes. The club was established at the sports facility behind Brimsham Green school. The facility was basic, just an all weather training square some fields and some run down changing rooms. But the enthusiasm of the growing membership was immense and the appetite to compete was large. 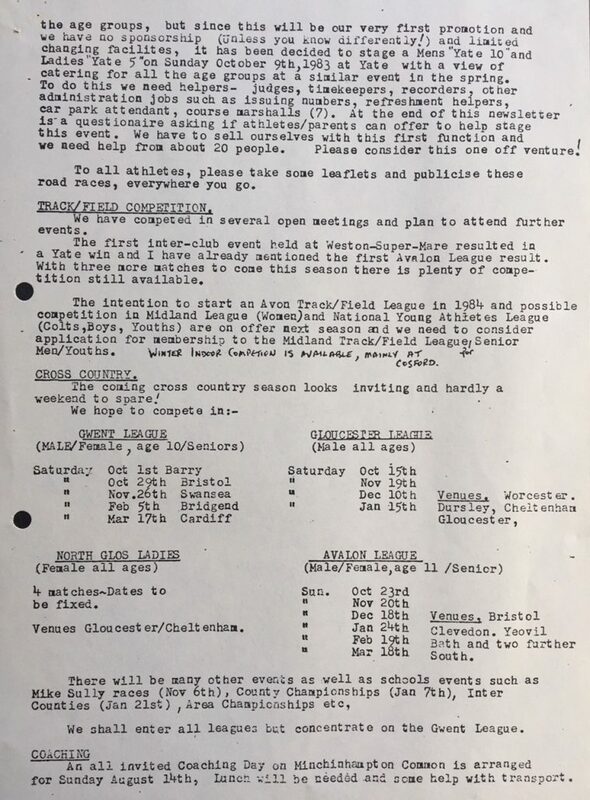 During the winter the club had teams in Gwent, Avalon and Gloucester Cross Country Leagues. 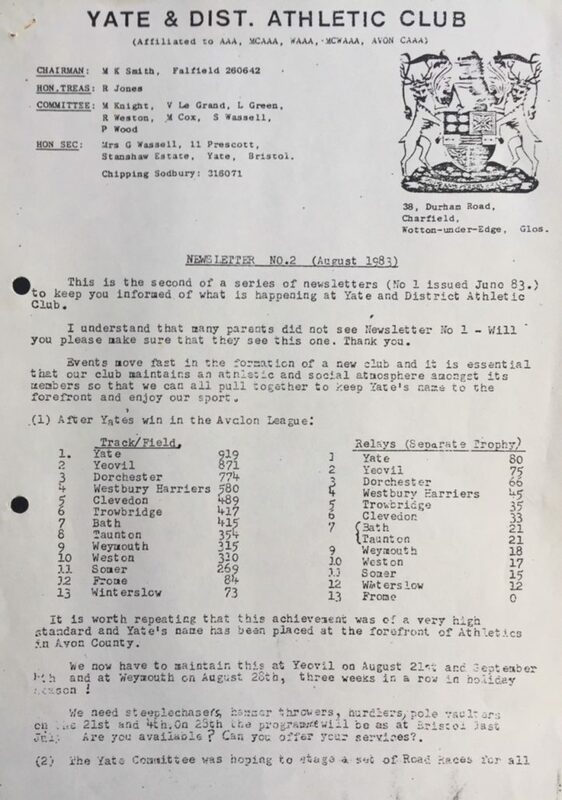 In the Summer, Midland League teams for both Male and Females plus Avon League and Young Athletes league. Someone, somewhere said there was a lack of facilities in Yate and The Sports Council decided to build a “hammer cage” for training. This is why the only facility at Broad Lane in Yate, apart from a grass area was a hammer circle. Shot and long jump were added as afterthoughts. Yate Town Council (a new SDP Council wanting to do something) contacted me and I met Susan Walker to discuss the needs and formation of the Club. 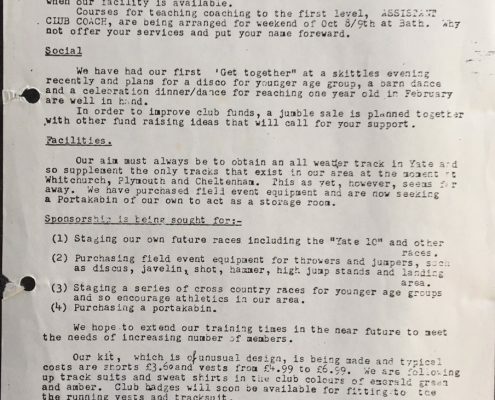 I insisted that a track was the main requirement and meetings took place to look into forming a club. 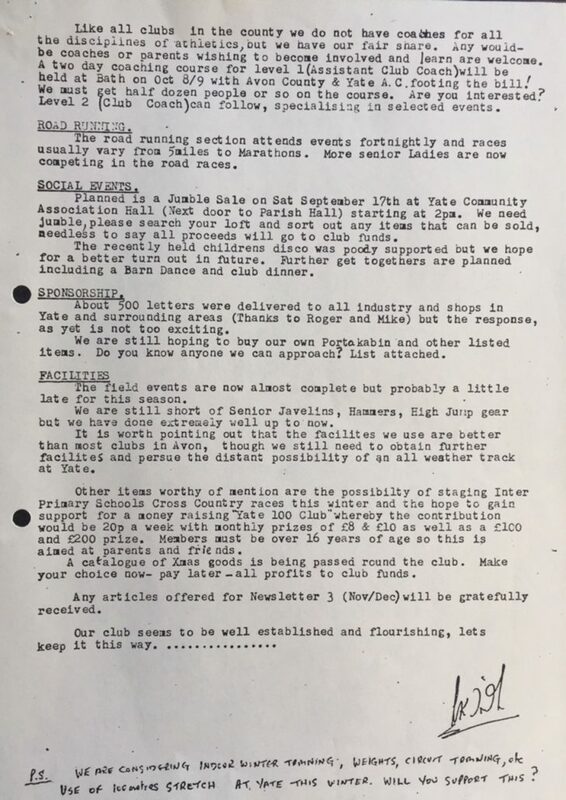 On 9th February 1983 after discussion I agreed to form a Club. I appointed myself as Chairman and asked Mrs.Glory Wassell and Mr. Vic Le Grande to become involved which they agreed to. 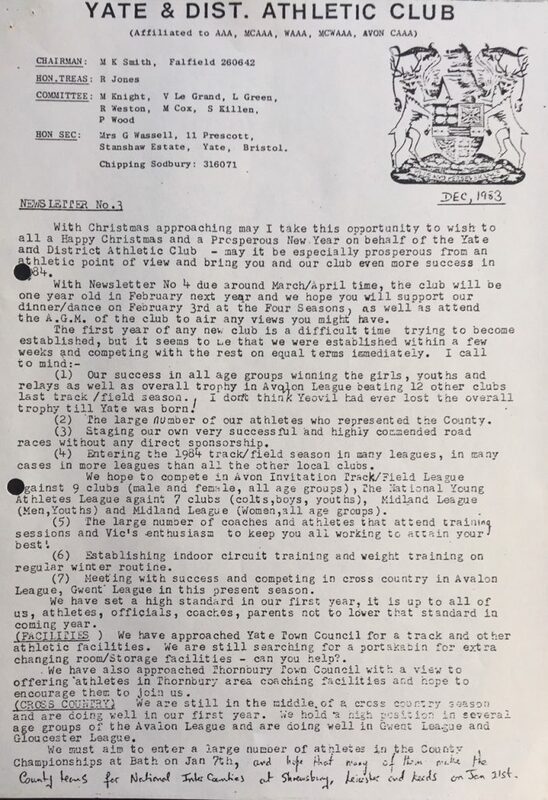 On Sunday 20th February 1983 our first training session took place. 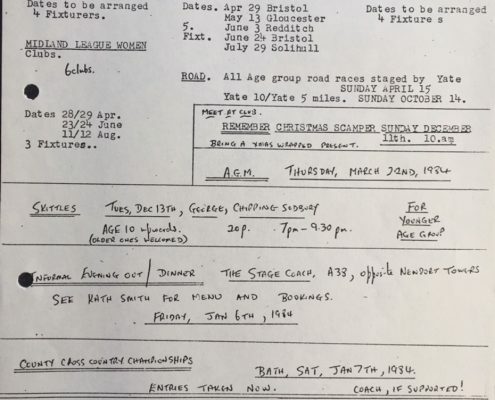 3rd March 1983 saw the first members join the Club. 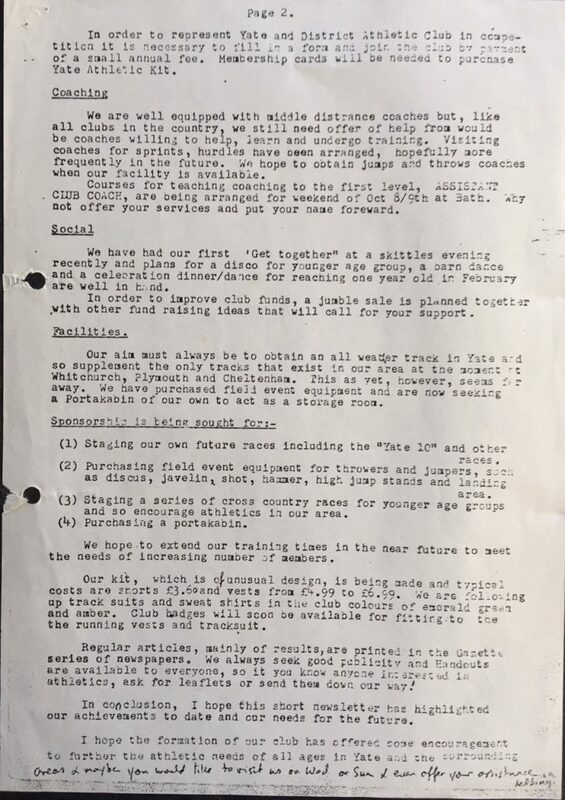 The first A.G.M. 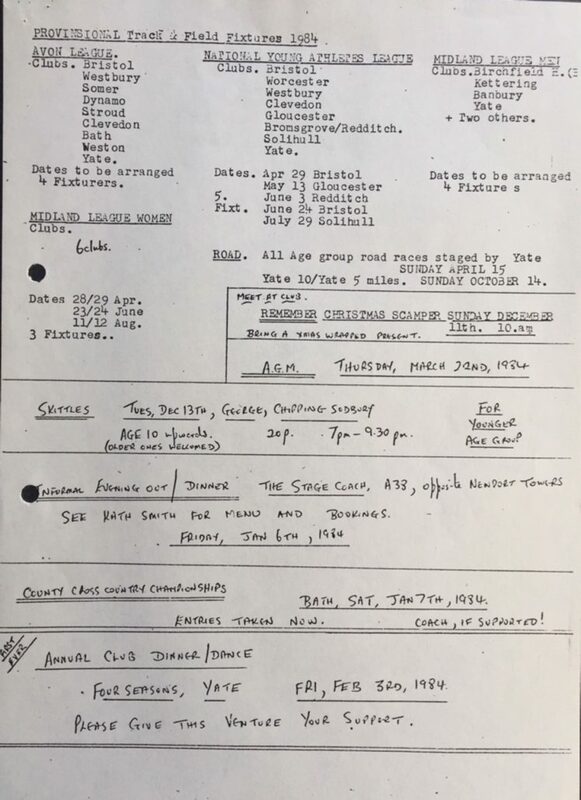 of the Club was held on 17th March 1983 and I presented a constitution. 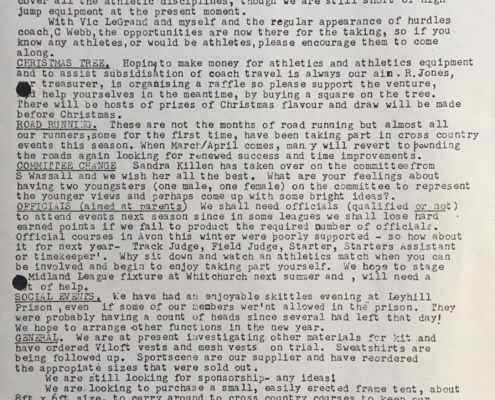 Through the summer of 1983 we competed for the first time as a Club and I appealed to “all and sundry” for financial assistance. October 1983, Yate staged their FIRST EVER Road Races. 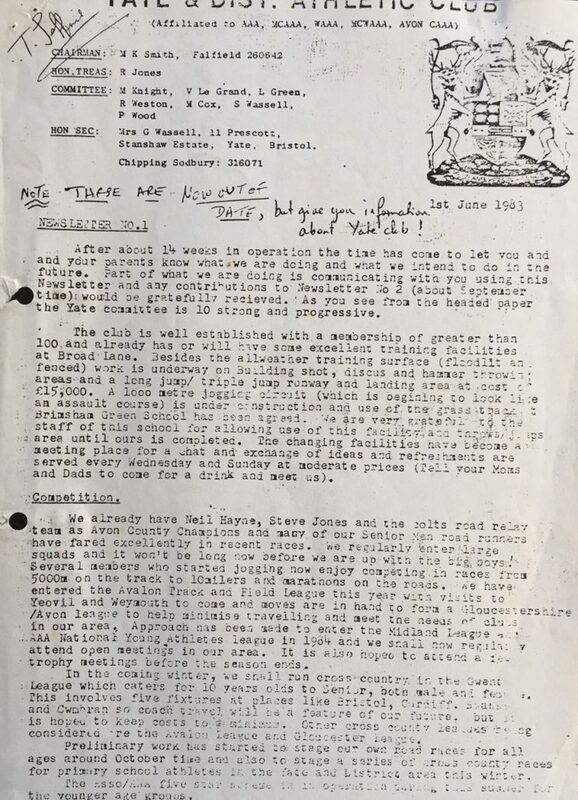 From 1984 onwards Yate won the Mens Midland League Division 8, 7, 6 titles and gained promotion the following year. The Club won the Mens Midland League Cup (Div B) for two years running and beat Bristol AC for the first time to take the overall trophy in the Avon Track and Field League. 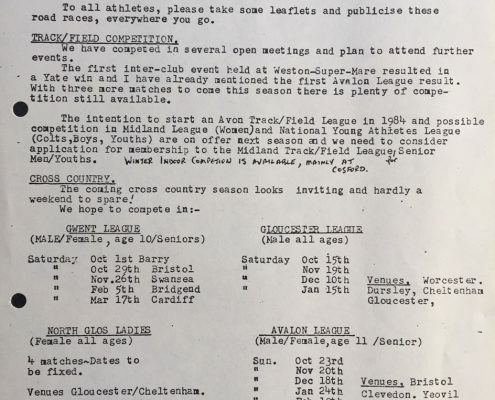 On the administration front, 1985 was the main year for building a case for track facilities at Yate (Broad Lane) and after many meetings, an eight lane international track became a reality within 5 years of the Clubs formation! The track was opened in May 1989 with a Young Athletes meeting. 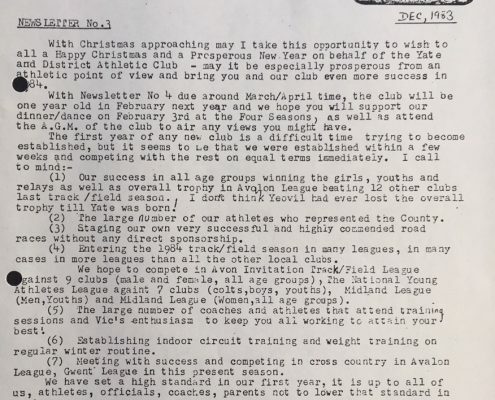 Lynn Davies (Olympic Gold Medallist and former Long Jump World record holder) performed the ceremony and from then on the club never looked backwards and has now become the leading athletic club in this area. The first inter-club event, held in Weston-Super-Mare, resulted in a Yate win. 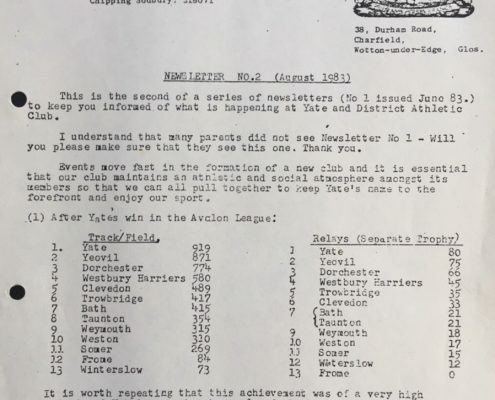 Yate were also involved in an ‘Avalon Track & Field League’, a pre-cursor for the Avon T&F League, where they beat 12 other clubs, including Yeovil, who had never lost before! Yate also won a separate Relays Trophy against the same clubs. 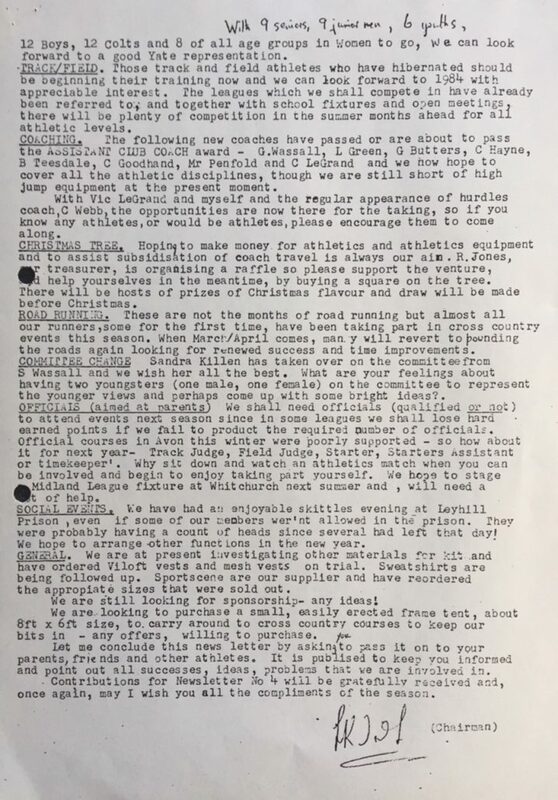 Possible application to join Midland League and National Young Athletes League.